The bearings are available in open and sealed designs. Due to the manufacturing processes used, open bearings can have turned recesses in the outer ring for seals or shields. Sealed bearings are maintenance-free and therefore allow particularly economical bearing arrangements. Due to the raceway geometry and the two rows of balls, the bearing can support forces in both radial and axial directions. They are therefore particularly suitable for use in pumps and agricultural machinery. 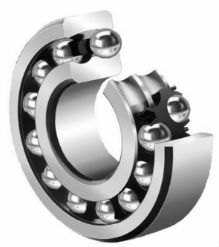 Furthermore, double row angular contact ball bearings are used in applications including conveying equipment, packaging equipment, elevators and compressors. The angular adjustment facility of angular contact ball bearings is very limited.